Halloween will soon be here again. Lots of party fun will be going on. 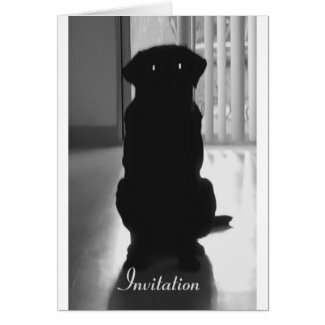 So how about a creepy dog invitation to give your guests a chill from the moment they know that you have a party? This photograph was one of those happy accidents. I was photographing my dog with bright sunlight coming into the room behind him. I accidently used flash on my camera and as it happened my dog was looking straight back at me. The result would have been "red-eye" in a normal photograph, but here it gave him bright shining eyes which give him a sinister, devilish appearance.